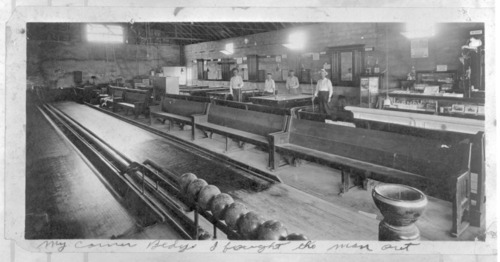 This image is of an early bowling alley and recreation parlor in Howard, Kansas. Two bowling lanes are pictured in the foreground, but the featured subject in the photo is a group of four men playing pool or billiards. Several benches face the bowling lanes. A counter to the right of the pool tables includes a display case marked "Candy." Behind the counter is a sign which includes a "Blatz" notation, suggesting that the business also served beer.